I love the holidays but so much joy can be exhausting. The things I normally love doing – seeing friends, decking the halls, shopping, traveling – become stressful when done for 31+ consecutive days. I miss my kitchen and get in a panic about getting home too early to sleep and too late to cook. 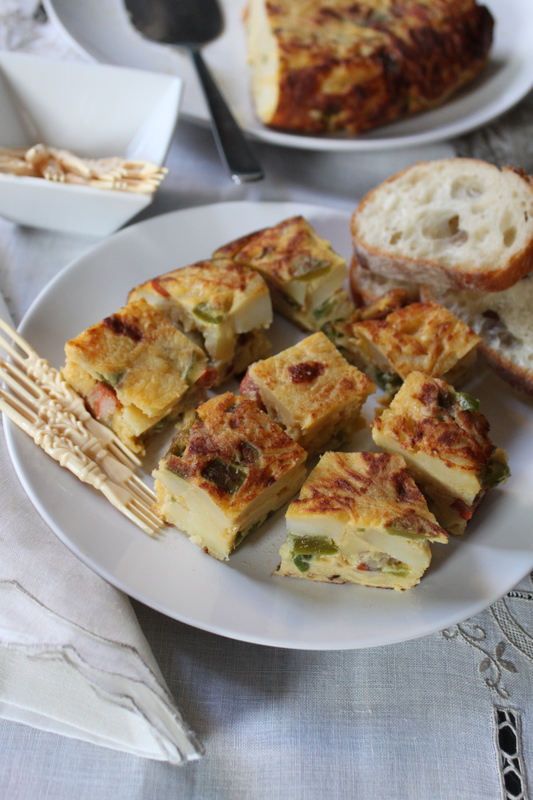 Faced with the prospect of nighttime pop tarts (organic maybe but still) and cold bowls of cereal, I opted for tortilla de papas instead. Normally, I go with the plain version made with potatoes and onions that I first learned in Madrid (where it’s never late). 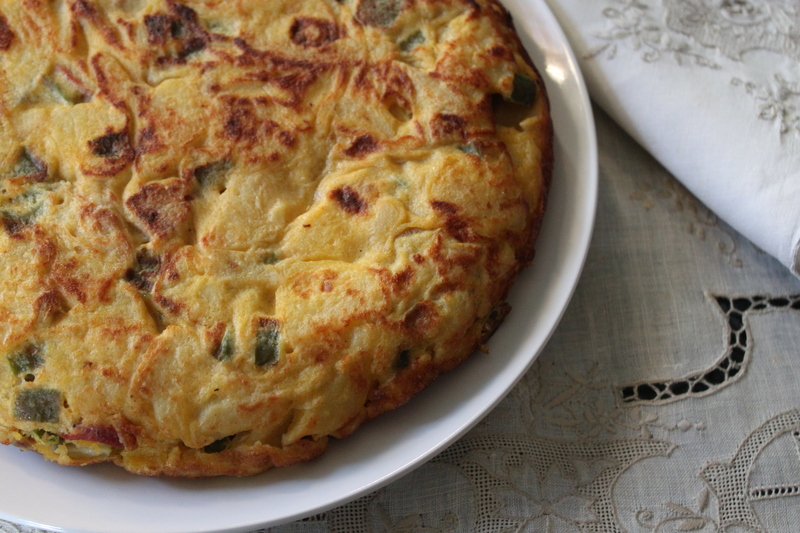 The simplicity of a traditional tortilla is hard to improve upon and adding ham, chorizo or peppers makes it different but not always better. I changed my mind when I spotted a tray of Spanish chorizo in a butcher shop on Smith Street that looked to good to pass up – so I didn’t. After lightly browning the chorizo and adding the garlic and peppers, I slow-cooked the potatoes and onions in new Chilean olive oil I was trying out. For once the potatoes didn’t drown out the chorizo though next time I’ll lightly roast the peppers first. Two harrowing flips later, it was set and cooling. I always associate tortillas with the holidays. A tortilla with plantains is the first thing I ask for when I land in Miami and Christmas morning my aunt always orders a few sky-high ones from Delicias de Espana -more pillow than omelette- to start the day of picadera. Versatile and even better the next day, it’s great with toasted baguette and topped with aioli and red roasted peppers when I’m in a rush and alongside white rice and black beans when I’m not. Made on a Sunday afternoon when I had all the time in the world, it got me through the nights when I didn’t have any time at all. 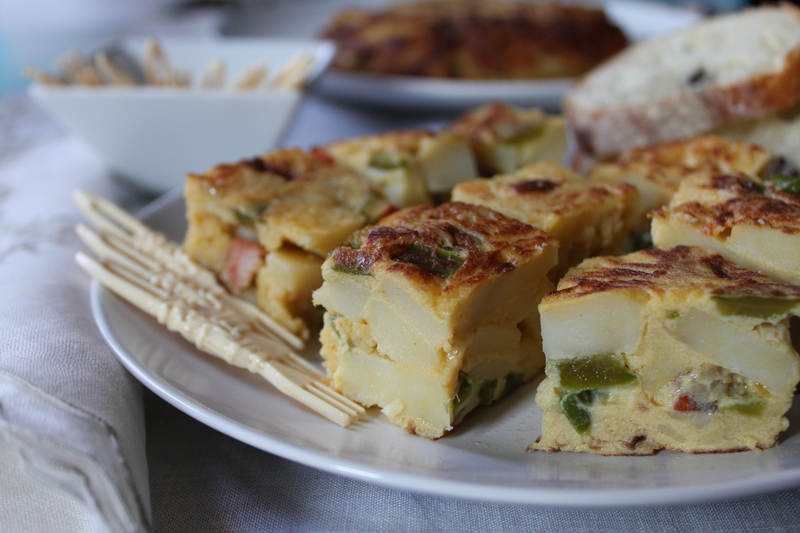 This was the first dish I made for my grandparents as an adult (or at least I thought I was) and I remember the relief I felt when my grandfather announced I had found el punto de la papa – the point where the potatoes are just cooked through enough to easily split in half. Of course, the flip is the most nerve wrecking part and, as I’ve said before, I’m superstitious about anyone else being in the kitchen when I do it. Or maybe I just want to buy myself some time in case I need to repair the damage. Heat the one tablespoon of the olive oil in large heavy skillet over medium heat. Add the chorizo and sauté until lightly browned, about 2-3 minutes. Add the peppers and garlic and sauté, about 3 minutes. Remove the chorizo and peppers from the pan and set aside. Add the remaining olive oil to skillet and return to medium heat. Add the potatoes and onions to the skillet and turn with a spatula, careful not to let them brown. Sauté until the potatoes are just tender and break apart with slight pressure from the spatula, about 20 minutes. Beat the eggs with the salt in a separate bowl. Remove potatoes and onions with a slotted spoon and add to the beaten eggs. Add the chorizo-peppers mixture and combine. Adjust salt to taste. Pour out all but about 1 tablespoon of oil and set aside. * Add the egg mixture to the skillet and cook over medium heat until the eggs begin to set and the underside is lightly browned. Take the skillet off the burner and cover with a large plate. Holding the plate down firmly, quickly turn over the skillet so that the tortilla slides out onto the plate. Return skillet to medium heat and add additional oil if needed. Slide tortilla back into the skillet and cook on the other side, an additional 5-7 minutes until it reaches desired degree of doneness. Flip the tortilla one more time onto serving plate. Serve at room temperature, sliced into wedges or cut into squares. *Note – I sometimes strain the oil I’ll be using and wipe out the skillet to remove any overcooked pieces of onion or potato before adding the eggs so that it slides out easily when flipped. Thanks so much for teaching me something new – I can’t wait to try this recipe. when you come home for Xmas I need you to make this!!!! This is a recipe that many Cuban families like the weekend lunch. It brings back good memories. I can’t wait to try this. Should I use a cast iron skillet or non stick? Thanks. My cast iron skillet but it weighs a ton and I don’t think I could manage the flip with it. Either should work as long as you have a good coating of oil so the tortilla can slide out easily. Let me know how it works! La Tienda.com sells a doulbe-sided (as in 2 fryng pans) with hinges connecting them. They are non-stick making the flipping of the tortillas VERY easy. Of course this item is made in Spain and imported. 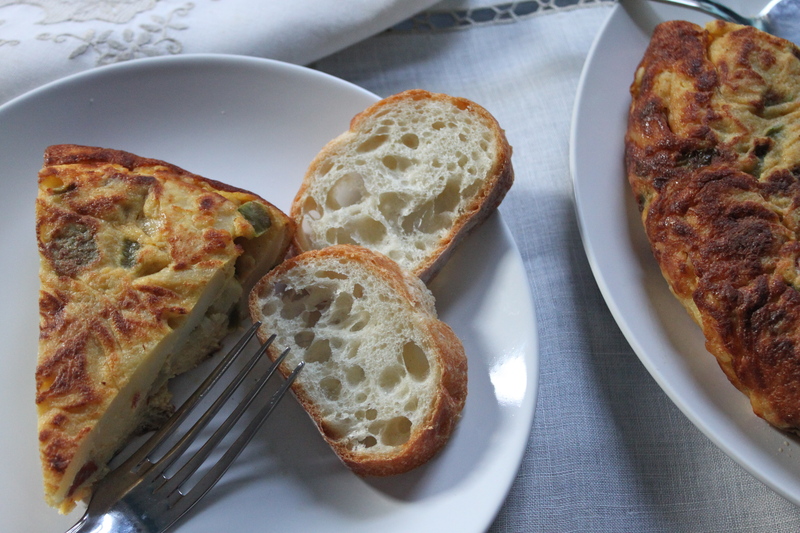 The Spanish are fanatical about their Spanish tortilla and since they are served everywhere at all times in every main city an item to accomadate its creation is the natural result of this unique double frying pan. I even found a mini doule frying one which I use for pancakes a cinch to flip.